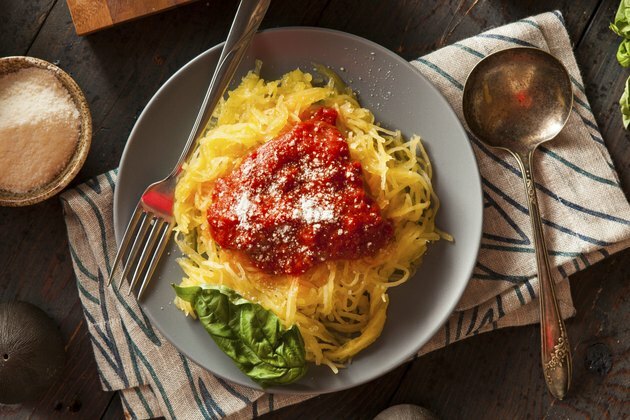 Whether you're trying to cut back your calorie intake or just eat more vegetables, spaghetti squash can make a healthful addition to your diet. When cooked correctly, the flesh of the squash resembles strands of spaghetti, and the mild flavor pairs well with virtually any sauce or topping that you'd normally add to pasta. Use a skewer or fork to poke holes in the outer shell of the spaghetti squash, spacing them roughly 1 inch apart. Place the squash on a baking sheet and bake in the preheated oven for 45 to 60 minutes. You'll know the squash is done when the shell and flesh are just tender enough to slide a knife in and out easily. Cut the spaghetti squash in half lengthwise. Scoop out the seeds and soft fibers in the middle and discard. Place the squash cut side down in a shallow microwave-safe bowl or baking dish with 1/2 cup of water. Cover with plastic wrap. Microwave the squash on high for eight to 12 minutes, or until the flesh is tender and resembles spaghetti-like strands when combed with a fork. Heat a medium pot of salted water to a full boil. Place the whole spaghetti squash carefully inside the boiling water. Boil for 20 to 30 minutes, or until the shell is easily pierced with a knife or fork. Pierce the outside of the squash with a fork or skewer, creating holes all over the outside about 1 inch apart. Place the squash inside a slow cooker and add 2 cups of water. Cook on low heat for eight to nine hours, or until a knife can be easily inserted into the flesh of the squash. When the spaghetti squash is cooked and is cool enough to handle, rake out the strands of squash by pulling a fork over the flesh lengthwise. If the squash was cooked whole, you'll need to cut it in half and remove the seeds and fibers before raking out the flesh. You can then top the strands with pasta sauce, meat sauce, sauteed vegetables and fresh herbs, or anything else that appeals to you. If the spaghetti squash clumps together when you try to rake out the strands, it's been cooked too long. When cooking, check on the tenderness of the squash frequently to prevent it from becoming too soft.